The following text is the summary of an article from HET LAND VAN HERLE, 34th year, jan/mar 1984, „Arnold Schunck, een wever die zich handhaafde“ (a weaver who remained standing), the biography of a weaver from Kettenis near Eupen (today East Belgium), who founded a department store in Heerlen with his wife, by his grandson, P.J.A. Schunck. Click here for the original. Arnold Schunck was born in the village of Kettenis (now part of Eupen in East-Belgium). His parents were the weaver Nikolaus Severin Schunck and Maria Katharina Koppenberg. Encouraged by the discussions between his father and his eldest brother, Nikolaus jr., about the pros and cons of the mechanical weaving mills, he decided to find out himself which production method was the most promising. After his apprenticeship at J.P. Fremerey in Eupen, he went on 17 April 1860 to “Wanderschaft”, a customary way in the then Prussia to fulfill the conditions for admission to the “Meisterprüfung” (master's examination. For this purpose he was issued a “Wanderpass”, a special ID-card which had to be stamped by the police in every city in which he worked. Moreover, the next destination and the estimated duration of travel were noted in this pass. So the wandering was there to gather experience and put it into practice. From April 17th to November 5th 1860, Arnold walked on foot to, among others, Silesia (at the time an important center of the textile industry), Mannheim, Munich, Nuremberg, Berlin and Hamburg. The result was poor: he was able to exercise his craft just a few weeks. Most of the manufacturers did not want to have anything to do with such “Wanderburschen” nichts zu tun haben. This gave Arnold a life-long aversion to factory owners. He stuck to the wooden loom until his death. Even when the demand for hand-woven fabrics was declining, he could continue: As a pattern weaver, he produced small trials on behalf of large weaving mills before they brought out their collections. His father Nikolaus died in 1865. Joseph took over the weaving shop. The sons Arnold and Ludwig moved to Hauset. There they started dyeing and finishing yarn and fabric for the industry in the so called Kupfermühle (ancient copper mill). On January 25, 1873, Arnold married Anna Maria Küppers. From the estate of the father the two brothers received money and fabrics. The competition between the textile industry in Aachen and Eupen, however, was strong and led to the fact that the weavers in the country could not sell their fabrics. After the birth of her first child, Peter Joseph, a friend from Vaals (maybe Peter Josef Schunck) recommended a priest in Heerlen, the later bishop Savelberg, who had just founded an orphanage in which the children could also learn a profession. Herbs were also collected and sold. 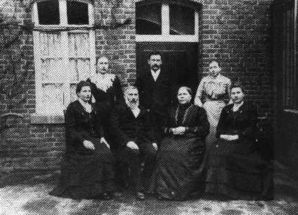 On August 25, 1874, they settled in the Schramm (Willemstraat) in Heerlen. The first store was not much more than a large living room. The half was occupied by five looms, a twisting machine (to turn threads together), and by shelves full of fabric balls. The herbal shop was in the other half of the room. From the peasants in the neighborhood they bought the wool, which was washed in the Caumer brook and dried and bleached on the meadows. Arnold always had two orphan boys as apprentices. The business went so well that the weaving could no longer keep up. Therefore fabrics were purchased in Aachen and Mönchen-Gladbach. The store was moved 1882 to the Kirchplatz (Church Square). 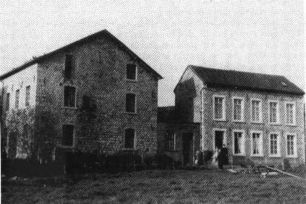 This building was demolished in 1894 and replaced by a larger shop. What was the secret of their success? Arnold and Anna matched well: he was the expert, she was the businesswoman. Their children helped after school. But especially the stormy development of the coal mining in the region and the strategic location next to the main church of the city, in addition to good management, caused the flowering of Schunck. The farmers came on Sundays, not only to the church and to the Sunday market to sell their products, but also to shop. The hand weaving could not last long. The patterns were also increasingly machined. So the weaving room was transformed into a tailor’s shop in which elsewhere woven fabrics were processed. See as well: A Handweavers Pattern Book - Patterns for 4 shaft weaving, mainly from European immigrants in the USA, specially the Pennsylvania Dutch (whose origin is german =deutsch, not dutch =nederlands.